Elliott Training have been providing successful training and development programmes since 1996 and we love it! We get a buzz from the altruistic sense of genuinely helping people, of unlocking potential and helping individuals, teams and organisations to be the best that they can be! We are particularly skilled and experienced at designing and delivering bespoke tailored Leadership and Management Development programmes encompassing all aspects of IT and Business Skills for companies with high growth aspirations, especially those who are seeking higher levels of performance from leaders and managers. To compliment the portfolio there are a range of additional services which come together to provide the Total Training Partnership. Services such as Training Needs Analysis, Project Management, Migration Planning coupled with an effective evaluation process. 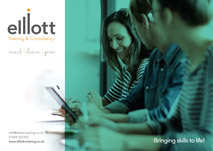 Click the image to download a copy of the Elliott Training brochure.